If you’re on your computer or online a few hours each day, and you go to a wide variety of web sites, or use lots of different programs, you have probably realized that using the mouse is a slow endeavor, and that keyboard shortcuts rock. Here are two that rock the hardest, in my opinion. Launchy is a text launcher that will revolutionize the way you use your computer. After installing, just press Alt-Space to pop up the launcher, and start typing the name of the program you want to launch, or even non-continuous letters of the program you would like to launch. Then, select from the list using the arrow keys the one that matches. Launchy quickly learns the programs you launch the most, so after a day or two, you’ll be amazing everyone with your program-launching skills. What if you can search something on google by typing “g something” on your web browser? Or search Wikipedia by typing “wp something”? Or UrbanDictionary, or YouTube search, or hundreds of other possibilities? Well, here’s a quick guide on how to set those address bar searches up in Firefox. 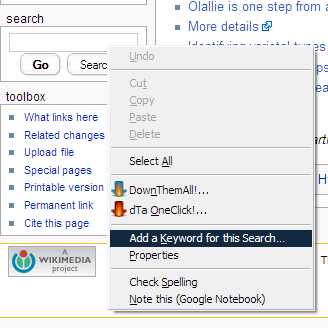 Type in a name for your bookmark, and a short, easy to remember keyword with which you can use your search. In my Wikipedia example, I used “wp”.